There are worse things than murder. You can kill a man one inch at a time. Last week I recommended Kansas City Confidential, a 1952 collaboration between Director Phil Karlson, Producer Edward Small and Actor John Payne. They re-teamed very successfully the following year to make this week’s film recommendation: 99 River Street. Payne is compelling as ultra-hard-luck Ernie Driscoll, a former boxer turned cab driver. In the opening scene, which is a pre-Raging Bull master class in how to convey the violence of boxing on film, Ernie is on the verge of becoming champion when he gets a bad break. And the bad breaks keep coming for the rest of the movie, in his marriage to his ice-cold beauty of a wife (Peggie Castle, at her best), in his friendship with a manipulative aspiring actress friend (Evelyn Keyes, on fire here), and in his battles with some ruthless jewel thieves who want to destroy him for reasons he can’t understand. His only consistent source of support is his former manager, a dispatcher at his cab company (played sympathetically by Frank Faylen, who played a cab driver in many Hollywood films and apparently got promoted). 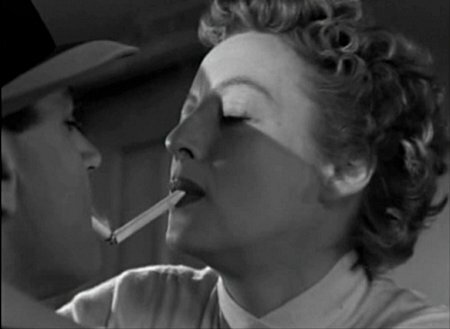 If this film noir/gangster melodrama deserves one adjective it’s brutal. There are many scenes of physical violence, filmed with unusual realism (My favorite is Payne’s torture by and knock down drag out with a karate chopping jewel thief played by tough guy Jack Lambert). The emotional violence is even more pronounced, particularly in a long, gripping sequence in which Driscoll is played for a chump by a group of “theater people”. The tragedy of Payne’s character is that while he once was a master of his violent nature, frustrations and failures have led him to become a slave to it, preventing him from being happy in his achingly simple new life ambition of moving from hack work to becoming the owner of a filling station. Payne and Karlson are well up to the challenge of bringing across Driscoll’s emotional flaws and vulnerabilities, while at the same time making him completely credible in the many physical confrontations of the story. The movie also gives the audience a fine bunch of criminals to root against. Brad Dexter (the guy from The Magnificent Seven whose name few people can recall) is both scary and smooth as the jewel thief who frames Payne for a terrible crime. Lambert exudes the menace that served him so well in his decades as a heavy in films and on television. Eddy Waller is even scarier in a different way as a criminal who has a kindly manner but in fact is a cold-blooded killer. The final, extended confrontation at 99 River Street of the protagonists versus the villains is thrilling and satisfying. The only weakness of this movie is the final two minutes, a tacked on “where are they now?”-style epilogue that is too upbeat and pat given the tone and content of the rest of the film (The otherwise perfect Sideways had the same flaw). 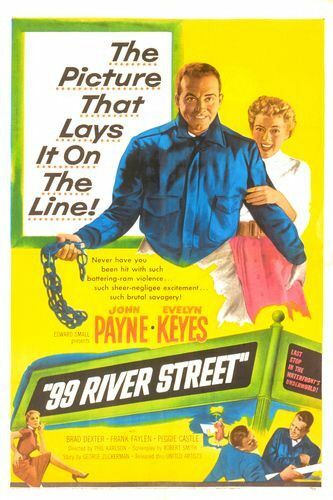 It was unlike Karlson to pull a punch, but it doesn’t diminish 99 River Street as a gritty, gripping piece of cinema. The movie seems to be on YouTube. 1 hr 39 minutes. DGM’s comment is helpful. Neither Netflix nor my local public library seems to have “99 River Street”, though Netflix did a fine job anticipating I was looking for it once I had typed in a few characters. Keith, you may have done this before but how about listing some of your favorite video sources. I ran an arts/foriegn film series in college, and saw many of the films I recommend on plain old film in a theater, which I know is not of help here. Internet Archive has many movies that are in the public domain, including some I have recommended. Services like Hulu and Amazon Prime offer a number of movies for free, again including some of I have recommended here. I realize that some are on YouTube, but after a consultation with Volokh found out that it is not legal for me to recommend that people watch films there.